CHECK BACK SOON FOR OUR NEXT ONLINE PROJECT. 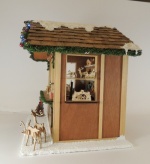 Presenting our very own 1/12 scale Christmas Market Stall project. Our stall stands 1 01/4" high, and is 10" across by 8" deep. It sits on a plywood base measuring 8" x 10". First let me state clearly that this kit does NOT include all of the Christmas ornaments, swibbogen, licterboggen, pyramids etc. I think that everyone will want to choose the decorations that they like the best to fill their stall. The items that have been used to fill my market stall are all items taht are available on our website, including 26 new for 2013 christmas items. However, all students who register for the market stall class will be given a coupon code good for a 15% discount on any and all christmas decor kits thru the end of December. Now let me tell you what IS included. The stall is made from plywood, and trimmed with basswood trims. The roof lifts off for easy access to fill your stall with decorations, etc. You will receive the base, all walls and roof and all of the stripwood to trim out the building. You will also receive the basswood front counter piece, and the darling three shelf display unit that is on the back wall of the building. You will receive the green garland, and the signage on the front of the building. And here is the best part. Thanks to our good friend Shelly at Evans Design, we aer able to include ALL of the lighting for this project. 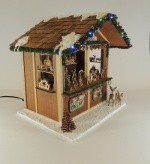 This includes the 26 light string of colored lights across the front, as well as the three strings of lights that are placed on each of the back wall shelves. Additionally, there are four led lights up in the ceiling to provide ambient lighting. These have been made especially for this project, with longer wire lengths, prewired harnesses, etc. All of this is designed to turn what could be a very challenging lighting project into one that is VERY easy to accomplish. And best of all, we are including a transformer that will allow you to have a single cord coming from the unit and plug into a regular wall socket. so no worrying about all those beautiful lights eating up batteries. The retail value of the lighting system is nearly 80.00, so our price for the stall project is really a steal, especially for such a great project. Students will need to provide basic tools. Supplies that students will need to supply include paints and stains, glue, and craft snow (if desired). Space is limited and available on a first come first serve basis. The market stall kits are scheduled to ship on December 1. Immediately upon your registration, you will be emailed your very own discount coupon code for the shopping cart, which will be good for a 15% discount on all of the items in our laser bits christmas shop. 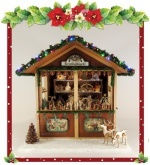 You can order the kits for the decorations now and be working on them while waiting for your building kit. IMPORTANT NOTE; PLEASE WAIT UNTIL YOU RECEIVE YOUR DISCOUNT COUPON CODE BEFORE ORDERING THE CHRISTMAS SHOPPE ITEMS. I AM SENDING THEM OUT THE SAME DAY YOU PLACE YOUR ORDER... AND PLEASE REMEMBER THE TIME DIFFERENCE IF ANY!!!! THANK YOU!! !